To begin with, this post is a continue version of the previous post ( The secret towards a stable buzz rate ). 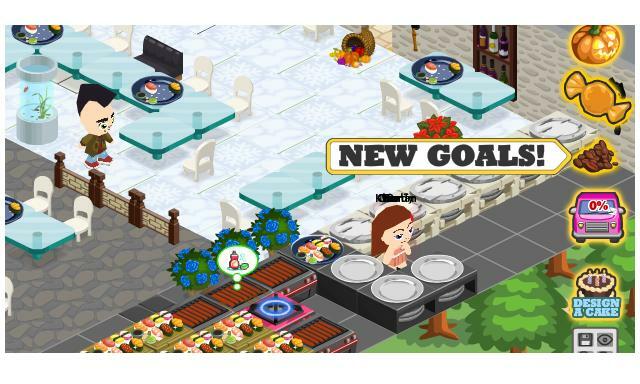 Well in this post we are gonna talk about how to place your stoves and counters in a strategic way to that your character do not require walk from one end to another end like this and to make all your Chef and Waiter/Waitresses stack up together like this. And last but not lease tip of the day! Minimize the amount of space the waiter will have to walk to serve customers. Forming a U-shape with the tables ! the open end facing the stoves and serving counters — is an easy way to pull this off. To lower the amount of customers that leave, use dividers and other obstacles as a way to slow down their walk to the table, giving you more time to prep food and serve more customers. Everyday when you harvest your cooked food, many gift sending stuff’s will appear and this too. The Daily cooking bonus. I want to share with you guys the mystery items that we would get by playing cafe world everyday! 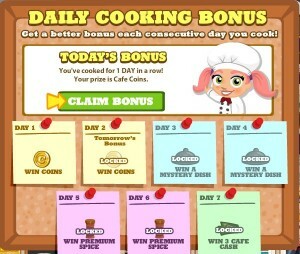 As the more days you play the bigger bonuses you get when you cook for the next day! 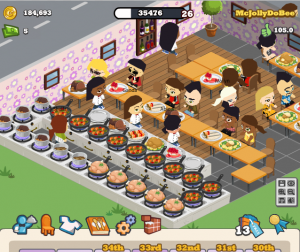 Welcome to the first cafe world tip post at this site! Hope this information do help in your gaming experience. You are currently browsing the archives for the Facebook games category. 2 Column Kubrick Plain theme from TechieCorner..